The ideal solution for interior woodwork, combining the benefits of both oils and waxes to provide a very hard wearing, durable and non-yellowing finish for interior woodwork. Available in 15 different colours (see right). Developed from natural, renewable sources the Osmo Polyx Oil is free from biocides and preservatives. Safe for children's toys when dry. 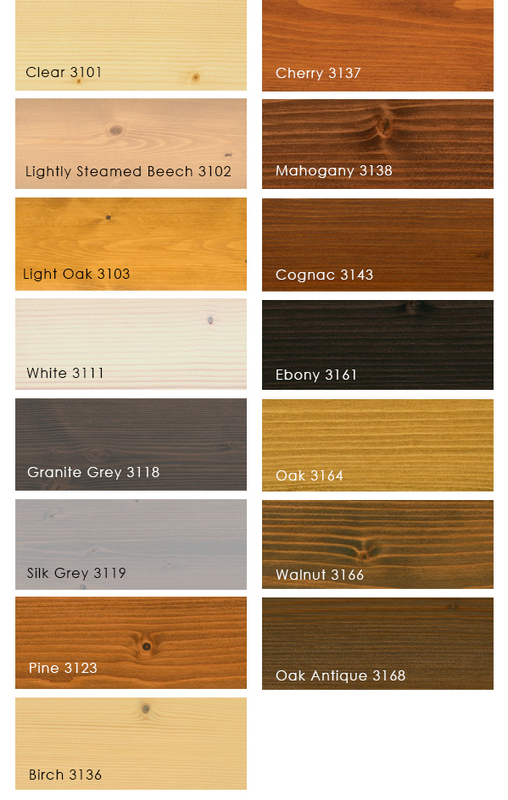 Osmo Wood Wax Finish can be used for floors. For this purpose, it is recommended to use just one coat of the Wood Wax Finish followed by a protective coat of Osmo Polyx Oil. For furniture, joinery and children's toys, 2 coats of Wood Wax Finish can be applied to achieve an opaque finish. The Wood Wax Finish is microporous, does not crack, peel or blister. Ensure wood is sanded to no finer than 120 grit. Coats should be applied thinly, ensuring the finishing stroke follows the direction of the grain. For a Transparent finish apply a single thin coat, applying the Wood Wax along the grain. For a more intense, less transparent colour add a second thin coat. For Flooring, apply a single thin coat of the Osmo Wood Wax Finish. Once completely dry, it is important to finish with a protective coat of Osmo Polyx Oil. For cleaning we recommend using the Osmo Interior Spray Cleaner, for persistent stains use the Osmo Liquid Wax Cleaner. Osmo Wood Wax Product Information Sheet. Osmo Wood Wax Finish Safety Data. Click the button below to add the Osmo - Wood Wax Finish, Transparent to your wish list.